An Exhibition Stand Attraction with a twist! That will make your event go with a spin!! 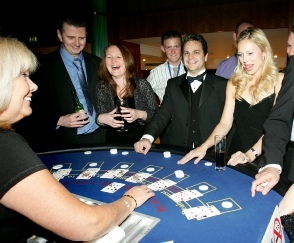 We have a range of first class casino tables hire with professional croupiers lighting and props. 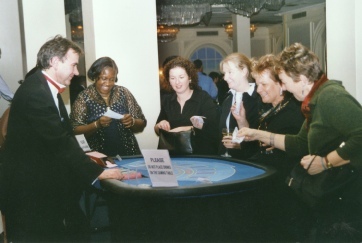 Exhibition Stand Attractions has been hiring leisure equipment for over 20 years and one of the most satisfying items is the mobile Fun Casino Table hire with the profession Croupiers in Central London and the home counties and UK. Roulette. Blackjack. Caribbean stud poker. Texas Holdem'. Craps. Wheel of Fortune. Punto Banco. 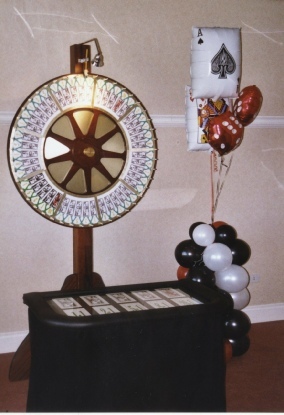 Our all-inclusive package includes the delivery with set-up of our full sized tables, all the fun money, the gambling chips and of course the professional croupiers. If required we can supply individual table lights for each table should you like to dim the main overhead lights, making the gaming table much more intimate. Should your guest not be sure of the rules. The croupiers will explain how to play. We can also provide pamphlets on how to play for each type of table. 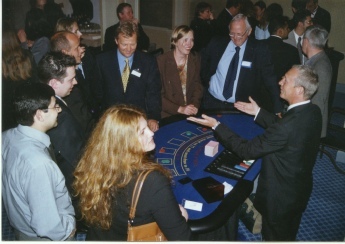 Mobile Fun Casino tables with Croupiers - Fun Casino Table Hire Central London. Virgina Water, Maidenhead, Ascot, Bagshot, Woodley, Bracknell, Wokingham, Crowthorne, Thorpe, Beaconsfield, Henley-on-thames, Marlow. Sunbury. Fun casino is purely for fun, the stakes you play for, can be fun too: from champagne, gift vouchers to holidays or maybe the product you’re launching! Fun Casino Games adds an element of eccentricity with participation for one and all to have a good time and interact. This can be a very cost effective way to give an impressive punch to your exhibition stand attraction, trade show or conference event. The overall effect will make sure your trade stand event is a memorable time by your clients. 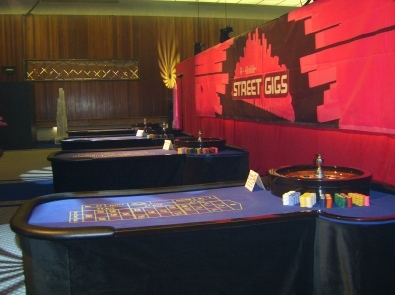 Our mobile fun casino tables and associated items are kept in tip-top condition ready for the most prestigious show. The professional Croupiers are always helpful and informative whenever anyone needs to be given a quick lesson on how to place a bet or how to best play at the table. This service is provided in central London, UK and International. 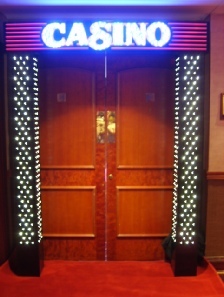 Casino entrance, casino hire Kent, casino night, casino party, casino party games, casino tables for rent, casino tables for wedding reception, casino table hire, casino table hire Berkshire, casino table hire London, corporate casino night, corporate casino party,l fun casino hire, fun casino hire London, fun casino London, fun casino night, fun casino party games, James Bond casino party, James Bond themed party, Las Vegas casino party, mobile casino games, mobile casino hire, mobile casino hire London, mobile casino London, mobile casino tables, mobile fun casino, mobile fun casino London, mobile fun casino hire, mobile fun casino table hire, mobile fun casino tables, rent a casino night, themed casino night, themed casino party. 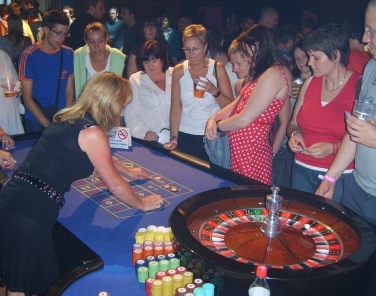 Casino table hire Windsor, mobile fun casino hire Windsor, mobile fun casino table hire Windsor. Alexandra Palace, Business Design Centre, Bournemouth International Centre, Donington Exhibition Centre Donington Park, Earls Court, Epsom Downs Racecourse ExCeL, G-Mex Centre, Hilton Brighton Metropole Hotel, Manchester Central Convention Complex, Novotel London West, National Exhibition Centre, Old Billingsgate, Olympia, Queen Elizabeth II Conference Centre, Ricoh Arena, The Royal Armouries Museum, Sandown Park Exhibition and Conference Centre, Stoneleigh Park, Telford International Centre, The O2 Arena, The Brighton Centre, Cardiff International Arena, expo. Ice Cream Props and Acessories. Pick and Mix Side Panel Info.